Welcome to Brooklyn, the coolest, most dynamic borough in the Big Apple. Not just the center of all things hip and artisanal, Brooklyn also happens to be one of the best places to eat in the country right now, where dining standards like locavore-ism and farm-to-fork trends hit here early on. This guided half-day culture-and-food-centric tour winds throughout Brooklyn, revealing the hip 'hoods and the off-the-beaten-path eats that you'd be hard-pressed to find on your own. Your journey begins in the historic West Village, the past and present home to some of the city's most influential residents. Then, along with your knowledgable food-crazed New Yorker guide, hop into the air-conditioned shuttle and venture across the Williamsburg Bridge. Journey around the ultra-Orthodox Hasidic Jewish section of Williamsburg, where families stroll the bustling streets that look like they haven't changed in a generation or two, before hitting the hipster section of the neighborhood. Williamsburg is one of the best restaurant neighborhoods in the city where third-wave coffee roasters sit next to cutting-edge farm-to-fork restaurants. 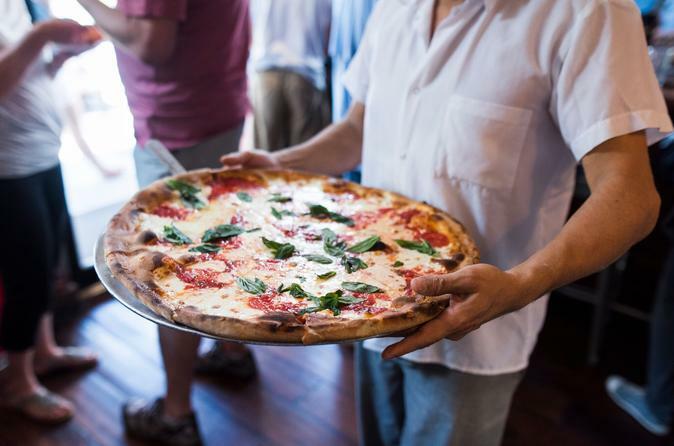 Indulge in a slice of Neapolitan pizza or a cannoli before moving next door to Greenpoint. Wander around Greenpoint, a neighborhood where you may hear "dzień dobry" as much as "hello." That's because the area has long been home to the city's Polish residents. Stop into a traditional Polish eatery for scrumptious meat-stuffed pierogies and juicy kielbasas. The tour suddenly gets sweet in DUMBO, an atmospheric part of town that stands for Down Under the Manhattan Bridge Overpass. Sample some delectable sweets at the Jacques Torres chocolate factory and then walk it all off at the recently re-constructed Brooklyn Bridge Park (make sure you bring your camera for the incredible views of the Manhattan skyline). Then return to Manhattan, pleased with your newfound knowledge of New York's coolest borough.